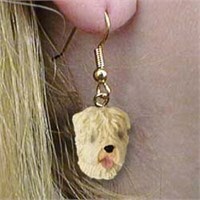 Nothing beats the exceptional look and quality of our Wheaten Terrier Earrings. Among the finest made, you will be provided with great satisfaction and long lasting enjoyment. Why not pamper yourself or give a loved one a Wheaten Terrier gift to show them how much you care. 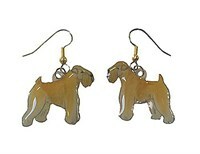 The Wheaten Terrier Earrings will make the perfect gift for any Wheaten Terrier lover. Shop with confidence, because all products come with a 100% customer satisfaction guarantee. Click over now to see the big selection of Wheaten Terrier gifts we offer. 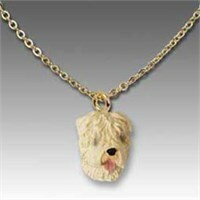 Nothing beats the exceptional look and quality of our Wheaten Terrier Necklace. Among the finest made, you will be provided with great satisfaction and long lasting enjoyment. Why not pamper yourself or give a loved one a Wheaten Terrier gift to show them how much you care. The Wheaten Terrier Necklace will make the perfect gift for any Wheaten Terrier lover. Shop with confidence, because all products come with a 100% customer satisfaction guarantee. Click over now to see the big selection of Wheaten Terrier gifts we offer. Nothing beats the exceptional look and quality of our Wheaten Terrier Pin. Among the finest made, you will be provided with great satisfaction and long lasting enjoyment. 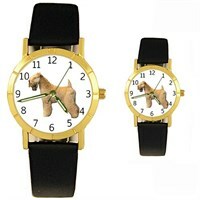 Why not pamper yourself or give a loved one a Wheaten Terrier gift to show them how much you care. 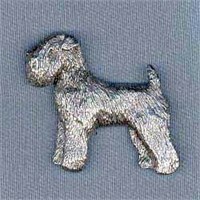 The Wheaten Terrier Pin will make the perfect gift for any Wheaten Terrier lover. Shop with confidence, because all products come with a 100% customer satisfaction guarantee. Click over now to see the big selection of Wheaten Terrier gifts we offer. Adore every second whenever you gaze upon your precious Wheaten Terrier Watch. Your pup will be the talk of the town on a gorgeous, Water Resistant Watch with a Lifetime Warranty and Stainless Steel Backing. So enchanting, the Wheaten Terrier Watch will easily fit all your loved ones with a 1 5/16" Diameter face for Men and 7/8" face for Women. Accurate down to the second with precise Japanese Quartz Movement, bring your beautiful Wheaten Terrier with you everywhere you go.